Boise State had a dream recruiting cycle. Texas and Oklahoma put the Big 12 even further in the rearview. And Vanderbilt’s road to respectability got even longer. The cost of competing in college football depends on your neighborhood. It takes a more prolific recruiting class to win in the Sun Belt than it does to win in the SEC. This post isn’t about the best recruiting classes, strictly speaking. It’s about the best classes relative to each team’s conference — in other words, who has the nicest house on the block. In this sport, out-recruiting your peers is by far the simplest path to contention, even if “contention” means going to conference title games and not the Playoff. This is the average national rank of the classes in every FBS league after National Signing Day, along with average four- and five-star recruits, all per the 247Sports Composite. These numbers are subject to change just a tad in the weeks, months, and even years to come, but at this point, they’re plenty fine to evaluate teams and trends. The only Group of 5 team to sign a blue-chip recruit was Boise State, which signed three. The Broncos have arguably the best mid-major class in the rankings era. Here’s a four-year outlook from Bill Connelly, featuring weighted averages and national percentiles. Remember that rankings are still wiggling around somewhat. The first one, then, won’t be surprising. The Broncos are the most reliable “non-power” in part because they develop players well and win a lot of big games, but also because they recruit like gangbusters. They’ve put together a No. 49 class that so thoroughly laps their peers that it should further guarantee their ownership of the Mountain West Mountain for years to come. The involved four-stars are QB Hank Bachmeier (the No. 6 pro-style passer), possible linebacker Casey Kline (the No. 16 ATH), and Austin Griffin (the No. 1 JUCO tight end). All three come from California. Former Nick Saban assistant Billy Napier is building the Ragin’ Cajuns into a serious Sun Belt contender, continuing by signing up 2019’s No. 71 class. The league’s West division is probably the worst in FBS, and ULL — which won it last year, in Napier’s first season — is poised to built a mini-dynasty there. Getting past App State, Troy, or whoever emerges from the other side of the league is still going to be a task. But recruiting at a solidly above-average AAC level is a hell of a good start if you’re trying to win the SBC. The Rockets signed the No. 78 class. This is already the best program in the MAC, with a comfortably league-best No. 48 average S&P+ rating over the last five years. Jason Candle, who replaced Matt Campbell when Campbell left for Iowa State, has quietly continued to do a really good job. Toledo and Western Michigan have been the top two recruiters in the league, but Toledo has started to open up a talent gap on everyone with this class. The Owls’ No. 57 class is a nice feather in Lane Kiffin’s cap. After a great debut in 2017, his team declined badly in 2018. That he was able to convince so many solid players to #ComeToTheFAU suggests a quick bounce back is plenty possible. It pays to lose one game in two years and have one of the best stadium environments in the sport. UCF’s No. 56 class is a ways ahead of several Power 5 teams, and it’s just the latest establishing point for the Knights as the best program in their league. Hopefully, McKenzie Milton heals quickly and gets back to dominating for this team. But the Knights have masterfully converted a few great seasons into a long-term recruiting edge that’s going to outlast any one player (and maybe any number of coaches, too). At No. 3, it’s Texas’ second top-three class in a row. Last year’s was strongest in the secondary. This year’s is most loaded at receiver and the defensive front positions. It’s not anything all that new, but Vandy’s even worse off now than it usually is. The SEC just had the best conference recruiting year in the rankings era, one in which most of its teams did somehow better than usual. But Vandy, which entered with a four-year recruiting ranking of 51, had the No. 57 class. When you’re Vandy, you can’t go backward while all your peers are charging forward. Derek Mason could be at serious firing risk in 2019, but unless his replacement’s name is “James Franklin,” the needle may not move that much. The Huskies (No. 124) should probably not be playing FBS football, exhibit 1,008. Charlotte is the rarest of jobs: a high-ceiling Group of 5 with no baggage, expectation, or obvious obstacles, with good facilities in a major metro in the South. That is an aspiring head coach’s dream and a vision for beleaguered vets too. For now, the 49ers have the No. 125 class, but check back in a year. The Mids (No. 123) are always going to recruit behind their conference’s pace, because they’re a service academy that runs the triple option. That’s not cause for concern on its own. But, they were legitimately bad in 2018, and another down year in 2019 would erode a lot of the good faith the program’s built up as one you should just trust to figure things out. 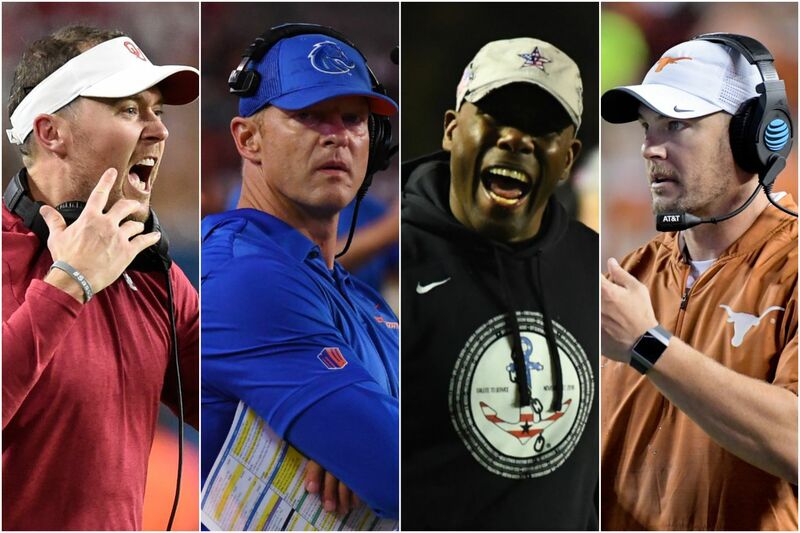 Tech typically recruits in the lower middle of the Big 12, and its typical struggles on the trail were likely exacerbated amid a coaching transition. Matt Wells still seems like a smart hire, and Kliff Kingsbury’s going to be better off in a league that has a draft. The ACC’s bad recruiting year didn’t prevent Louisville from getting lapped by the field. The Cardinals finished at No. 73, but they were an incredible 117th before the February Signing Day. Bobby Petrino left Scott Satterfield a smoldering pile of ash. The good news is that if any coach can win quickly despite a talent shortcoming, it’s Satterfield. KU is betting on Les Miles being able to recruit above the school’s standard by the sheer force of his personality. We’ll see how that goes in the long run, but this class is confirmation that it’s harder to recruit to Kansas than it is to LSU. Who knew? The Beavers are going to stay doormats unless former Washington OC Johnathan Smith can pull many rabbits out of his hat. A No. 67 class is behind even the Beavs’ low four-year average of 59th. Maybe some of that’s attributable to Oregon’s good year, but then, the big L.A. teams won’t recruit this mediocrely forever. Where’s OSU’s pipeline that’s going to get this program to contention in the North? That is a rhetorical question. Here’s a table you can play around with to see how your team fared.